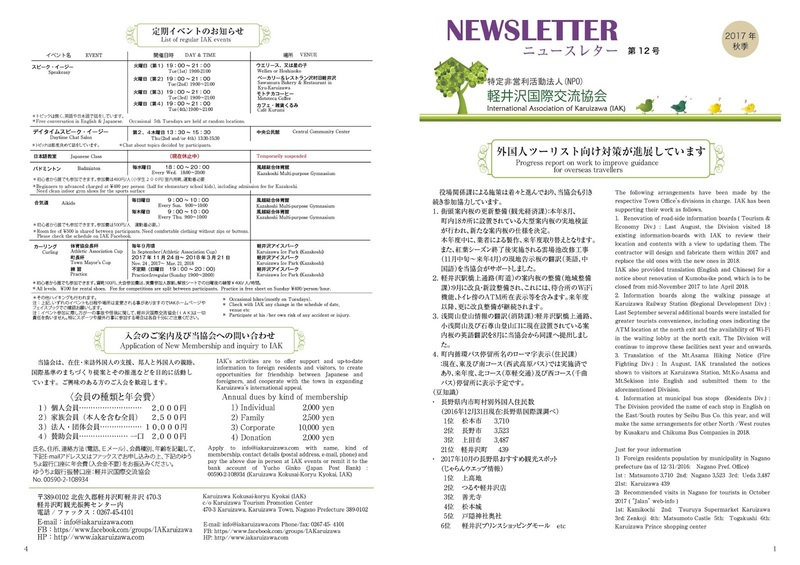 On July 26th, at the Chuo-Kominkan, IAK presented a special lecture meeting commemorating IAK’s 5th year, inviting two guest speakers, one is a Nobel laureate in physics in 2008, Dr. Makoto KOBAYASHI and another is Mr. Sei-ichi KONDO, former DG of the Agency of Cultural Affairs and ambassador. Both presented the forefront of Japanese international cooperation to an audience of about 110. KONDO spoke about present situation and problems to be solved of the Japanese international cooperation in development and peace. Dr. KOBAYASHI attracted an audience introducing modern particle physics research conducted in international cooperation. IAK Joined the Fureai Festival again this year. IAK’s foreign members participated again to the Fureai Festival organized by the Social Welfare Council on October 2nd and exchanged with many town people by vending Russian crepe and tea, German sausage and fried cakes. (Remarks) 1) Deficit in 2015 is due to office rent and it will be substantially covered by membership fees hike in 2016. 2) Expenditures in 2015 and 2016 include survey expenses with Matsumoto Univ. 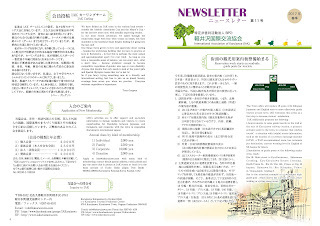 for inbound tourists in Karuizawa. Y.Murata, Kazumi I. Frost and A.Gregson got retired. IAK express deep appreciation to their contributions. 4. 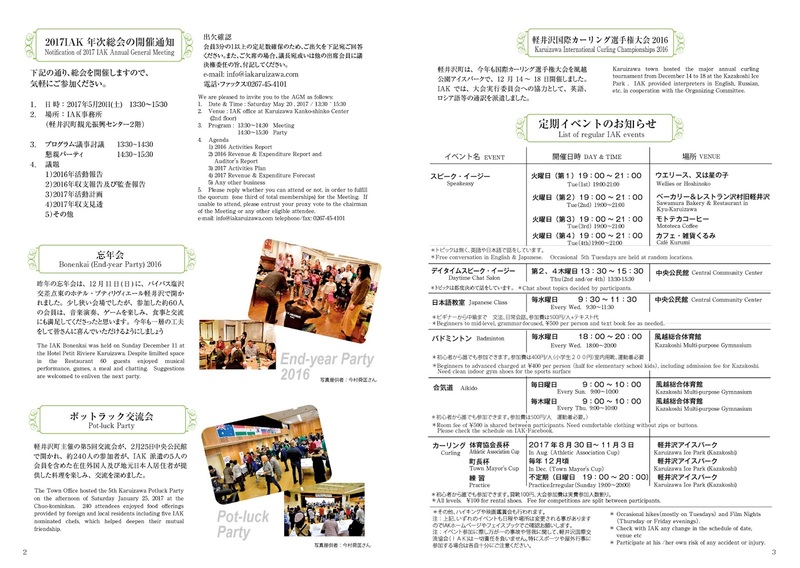 Admission : Yen 3,000 excluding beer 500 yen, wine 600 yen etc. Free below age 12. 5. Reservation only : Apply below by Dec 3 with your name and number of attendees. Reservation will be closed up to 60, due to space limit. 6. The hotel accommodates only 30 car park space. *Please confirm whether Hotel Wellies or Pension Hoshinoko is hosting on the IAK Homepage or Facebook. 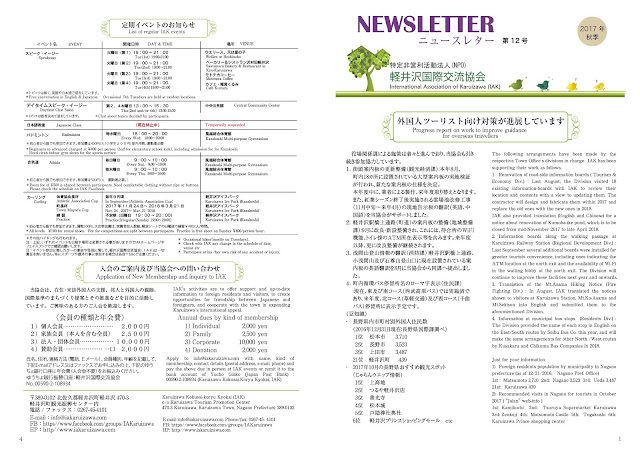 *Free conversation in English & Japanese. Avg. 20-30 participants in Summer and 10 in Winter. Occasional 5th Tuesdays are held at random locations. 300 yen per person and text book fee as needed. *No class if fifth Wed. Schedule in next year: Jan.11,18,25. Feb.1,15,22..
*Beginners to advanced charged at 400 yen per person (half for elementary school kids), including admission fee for Kazakoshi. Need clean indoor gym shoes for the sports surface. Aikido Every Sun. 17:30-18:30 Kazakoshi Gym Sub Arena. 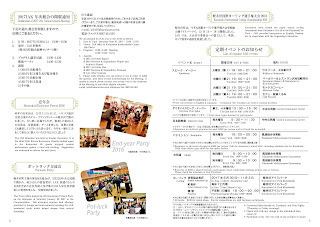 *Room fee of 500 yen is shared between participants. Need comfortable clothing without zips or buttons. Please check the schedule on IAK Facebook. *All levels. ¥100 for rental shoes. 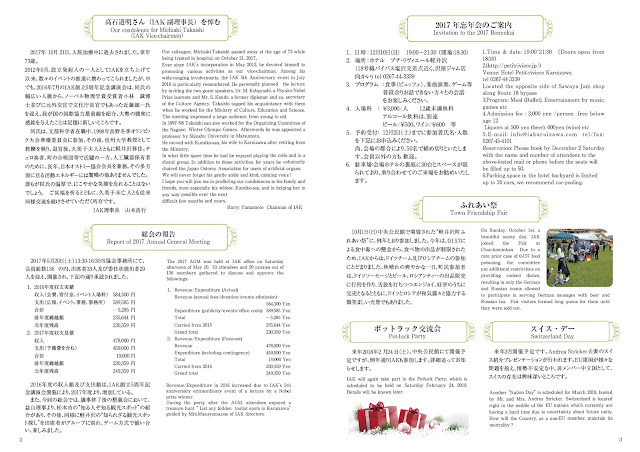 Fee for competitions are split between participants. Have you heard of a “Court Interpreter”? It sounds quite foreign to most of the Japanese people. When I turned 60 years old, I thought of contributing to the society, hopefully using my skill of English communication in the working environment at some foreign-affiliated firms in Japan. I successfully passed the examinations at Yokohama District Court, but it was difficult because the Japanese words for the court jargon were not familiar to many of us. Regarding the court jargon, there are two reference books under the editorship of the Japanese court, but some of the corresponding words there are not correct any more. For example, in Yokohama District, many cases are drug-related, and the particular use of words are required to avoid any objections or claims from the defendant side. “Kakuseizai” has been interpreted as “stimulant” for some years, but nowadays it is more precisely interpreted as “amphetamine” because there was a case that a defendant claimed that even coffee/tea is a kind of stimulant. This I learned at the latest seminar by the Tokyo Higher Court in December this year. At a court room, sitting just below a presiding judge, sometimes I regret why I accepted this scary job, but re-recognizing the importance of this responsibility and a good taste of beer after the work, I tend to say yes to the next request. 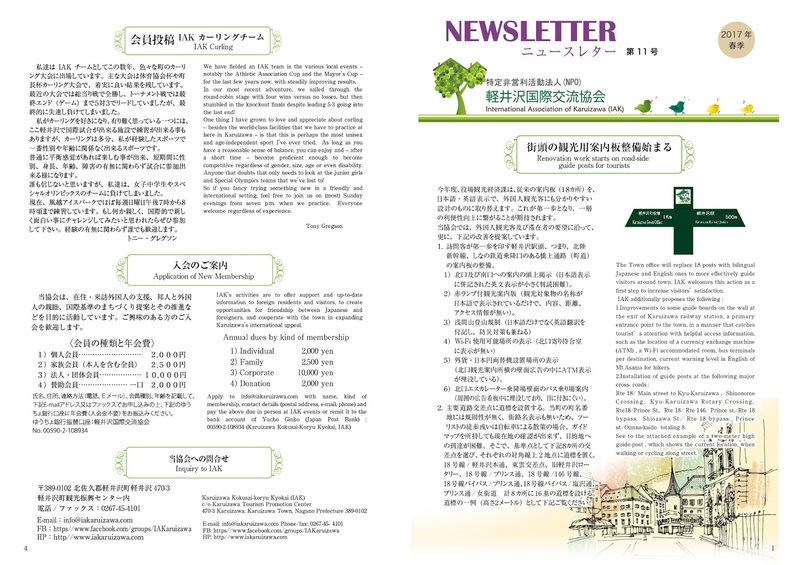 IAK is the organization to support foreign residents/visitors for living in Karuizawa, promote friendship among members/ local community and provide advice, information to make Karuizawa internationalized.